Residential Electrician Jackson, TN: Considering New Light Fixtures? Do You Need an Electrician to Install Light Fixtures? It’s a project that’s sure to come up a time or two during the normal lifespan of a home. We are talking, of course, about needing to change a light fixture or two. It’s a perfectly normal thing to need to do. Even if you purchase a brand new home and you think that the fixtures you’ve chosen are pretty timeless, the fact remains that there will come a day when you decide you need a change. That’s why in today’s post we’d like to answer a common question that we get: “Should I hire a residential electrician to change the light fixtures for me?” The answer is that it depends. In today’s post we’ll go into a bit more detail about the process so that you can make an informed decision. If you’re considering new fixtures in your home, today’s post is for you. Keep reading to learn more! One of the great inventions of our time is YouTube. It’s provided people all across the world with tips and tricks for how to get things done themselves. Air conditioning stopped working in your car? A quick trip to YouTube will show you that it only takes a $20 part and about a half hour of your time. The alternative is a $300 trip to the mechanic. It’s a no brainer! Unfortunately it also means that many people take on repairs that they shouldn’t necessarily be taking on. It is important to note that there’s absolutely nothing wrong with a DIY mentality, and it’s never a bad idea to consider what everyday tasks you could be saving money on. At the end of the day, it’s crucial to know what you’re capable of. That doesn’t mean that you can’t challenge yourself to learn something new, but it does mean that it’s important to listen to your gut. If you are hesitant to give something a try and it might be dangerous to you, it’s worth it to call a pro. When it comes to electricity, our advice is that you’re better safe than sorry. The last thing any homeowner wants is to be the cause of an electrical fire, or worse, a massive injury. “But isn’t swapping a light figure pretty simple? It’s just a couple of wires.” That’s a good point, and we’ll reiterate that if you know what you’re doing and you’re doing it the right way, you can probably change a light fixture yourself. If you’re not certain what goes where or if you’ll be able to do it right, give us a call! Our licensed electricians know how to get the job done safely and affordably, saving you time and hassle. Whether the project is new light fixtures or a whole home rewire, we bring years of experience to the table in order to give you peace of mind. 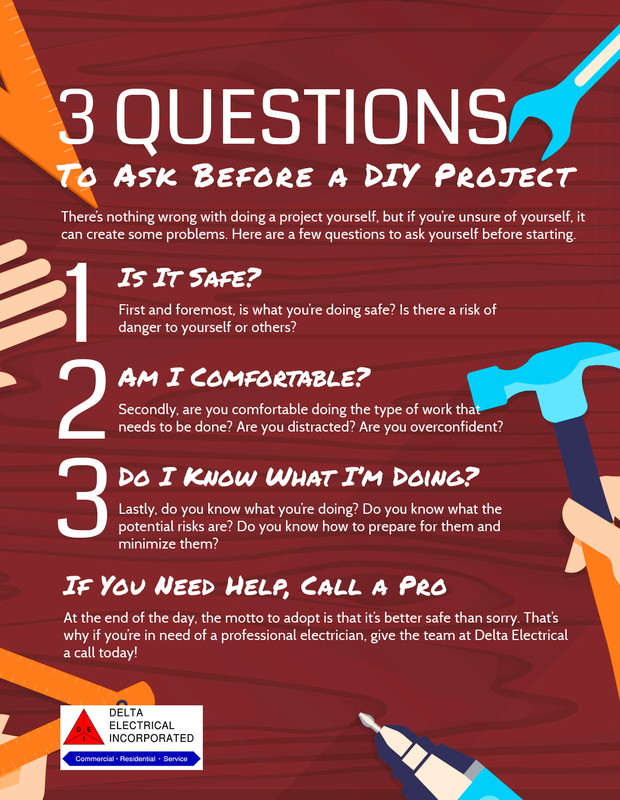 No matter the project, if you’re looking for an electrician in Jackson, contact the pros at Delta Electrical today. We look forward to hearing from you!